AL DHAFRA Air Base, UAE --- The U.S. Air Force’s fifth-generation multi-role aircraft arrived for its first deployment to the Middle East on April 15. The F-35A Lightning IIs are from active duty 388th and reserve 419th Fighter Wings at Hill Air Force Base, Utah. (EDITOR’S NOTE: The F-35’s first operational deployment, like many other events regarding this program, has produced a series of contradictions and inconsistencies that create needless confusion. -- On Friday afternoon Central European Time (CET), the Dutch online aviation magazine Scramble posted a story on its Facebook page titled “Hill F-35As On Their Way for Their First Combat Deployment” and tweeted about it. It said six F-35As had landed at Moron air base, near Seville in Spain, on their way to an unspecified destination. -- Also on Friday, Defense News posted a story on the same subject, promising it would be updated as information came available. -- By Monday morning CET, however, that story had disappeared from the Defense News website, and its author said she had written nothing on this deployment, and knew nothing about it. The author suggested in might have been an old story generated by a bug in the DN website. -- Also on Monday afternoon CET, the Public Affairs Office of the United States Air Forces in Europe – Air Forces Africa headquarters at Ramstein AFB, in Germany, said they were not aware of the F-35A deployment to Moron, but promised to look into it and report back to us. -- Both stories were posted during the night on the respective websites of the two fighter wings involved in the deployment (see above and following story). -- However, neither one provides any information about their transit to Al Dhafra, not their stop-over at Moron air base, which begs the question of why these details are being kept from the public. -- By Tuesday noon CET, we had not heard back from USAFE-AFA headquarters. The only logical conclusion, albeit highly speculative, is that an over-zealous interpretation of operational security rules led to Defense News deleting its story after it had been posted. If true, this in another instance of needless mysteries generated about the F-35 that entertains the many doubts and skepticism about the credibility of the program’s communications. HILL AFB, Utah --- F-35A pilots, maintainers, and support personnel from the Air Force Reserve 419th Fighter Wing and active duty 388th Fighter Wing deployed to Al Dhafra Air Base in the United Arab Emirates last week – the first Middle East deployment for the U.S. Air Force’s F-35A Lightning II. The group is made up of personnel from the active duty 4th Fighter Squadron and Reserve 466th Fighter Squadron, as well as Airmen from their respective aircraft maintenance units and a variety of F-35 support personnel. They will support efforts underway throughout U.S. Air Forces Central Command. When Stromberg isn’t in uniform, he’s a civilian pilot with Delta Air Lines. When he’s not serving part time in the Air Force Reserve, Shumway is a construction worker and business marketing student. The F-35A is the Air Force’s conventional takeoff and landing variant of the Department of Defense’s Joint Strike Fighter fleet. It provides greater operational capability by combining advanced stealth capabilities with the latest weapons technology. 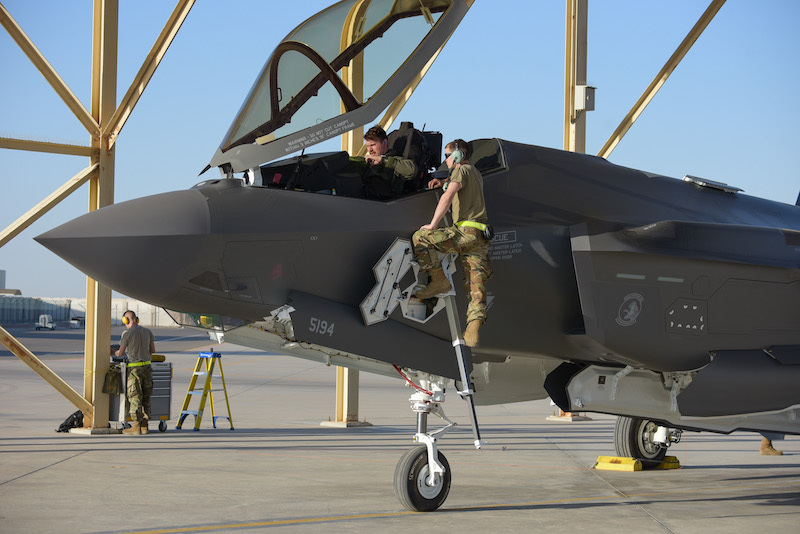 F-35A aircraft and personnel from Hill AFB previously deployed to Royal Air Force Lakenheath, England, in April 2017, as well as the U.S. Pacific region in the fall of 2017. Sabric also thanked the civilian employers of reservists who understand the importance of this mission and allowed them to take leave from their civilian jobs to serve in their military capacity. The 419th FW and 388th FW are the Air Force’s only combat-capable F-35 units, maintaining the jets in a Total Force partnership that utilizes the strengths of both components. Hill AFB is slated to be home to 78 aircraft by the end of 2019. HILL AFB, Utah --- Airmen from the 388th and 419th Fighter Wings here deployed to Al Dhafra Air Base in the United Arab Emirates last week to support the United States Air Force Central Command mission in the Middle East. The aircraft arrived on April 15.